Dr. Hougan is passionate about researching ways to support classroom teachers, specifically through teacher feedback and technology. 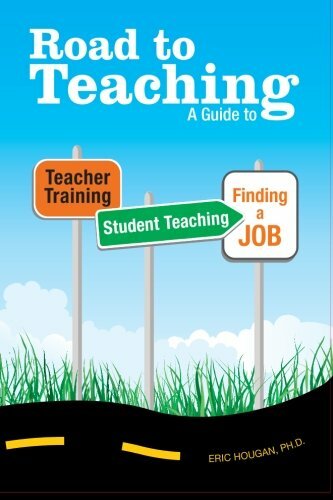 Author of Road to Teaching: A Guide to Teacher Training, Student Teaching, and Finding a Job. Road to Teaching - the website - is dedicated to supporting current and aspiring teachers through an education blog, the web’s largest collection of teacher interview questions, education resources, advice on student teacher topics, finding a teaching job, and much more! Maximize your teacher training, excel at student teaching, and find your ideal teaching job. This best-selling, highly rated book gives beginning teachers and job seekers a wide variety of valuable strategies and expert advice, allowing for a smooth transition from student teacher to exemplary teacher. Use Road to Teaching as a tool to navigate the unique stages of becoming an educator and helping you standout in today's competitive job market. “Road to Teaching: A Guide to Teacher Training, Student Teaching, and Finding a Job” by Eric Hougan, is exactly the tool I need to prepare for my teachers’ training programme. I just completed a Certificate in Rudolf Steiner Education in 2010, and I am about to start a Graduate Diploma in Teaching and Learning (Primary) in February 2011. (We have primary schools over here in New Zealand - I think you have lower and middle grade schools in USA as an equivalent). The book outlines very pertinent considerations for anyone who wants to get the most out of their teacher training course, and to then have the greatest chance of success in obtaining a teaching position. Already I have created a networking contacts list on Excel. And I will also be creating a Reading List of all the books I studied last year, and will be adding to it during this year’s study (and my own reading around the subjects). And that’s just from a few strategies in the book! I am making a list of ideas from “Road to Teaching” as I read, and I’ve now got a very detailed list of things to think about and do so that I am prepared for a year of productive learning (as well as some effective tools for organizing resources throughout this year and beyond). I highly recommend this book. It will help you to get the most out of your teachers’ training. It will also help you to be prepared for student teaching (well, as prepared as anyone can be...gulp). And it will help you to reflect and finely tune why you want to be a teacher and give you tools to develop way beyond your training. I am now looking at the next few years (training and getting a teaching position) from a higher perspective and I think that is one of the main gifts of this book. It helps you to define and keep in mind your vision for teaching, and then it helps you to become actively involved in making it a reality.